We have been blessed with an early, sunny and warm Spring in the Pacific Northwest. Tons of rain interspersed with sun has left our yard loaded with blossoms. My new rose bushes are absolutely bursting at the seams, which means that every room in our house is loaded with fresh, fragrant bouquets. The only problem, is that I’ve found it really difficult to part with the still beautiful, nearly spent petals. They are too pretty to dump in the compost. So, I decided to make use of them! There are tons of ideas on the internet and lots of ways to make roses into edible masterpieces. Most importantly, you need to make sure that your roses are spray free. You don’t want to poison yourself with pesticides;) I decided to start with rose vinegar, because it was the simplest. I filled a clean jar with a hefty handful of fresh rose petals and thyme blossoms, filled the jar with champagne vinegar and let it sit for 1-2 weeks. No measurements needed! Make use of your beautiful excess rose petals, with this easy vinegar recipe. Place petals and herbs into small glass jar or mason jar. Cover with vinegar. 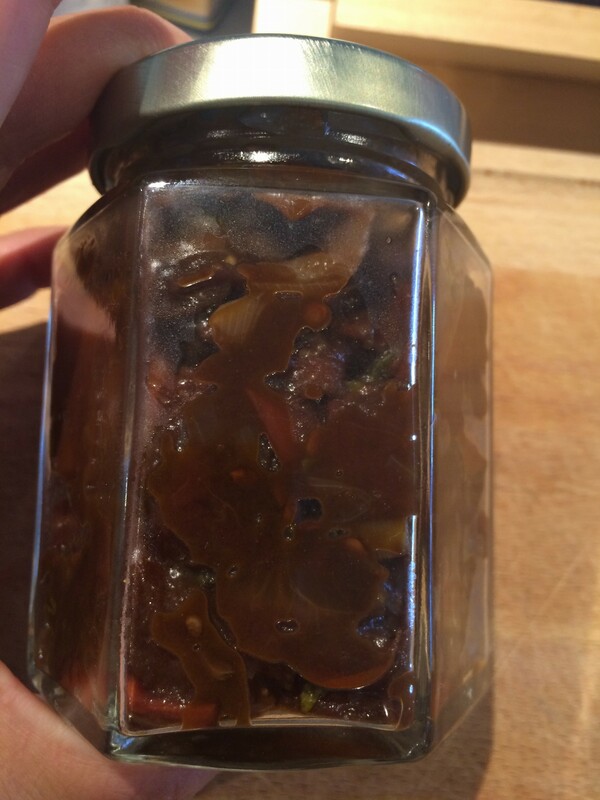 Seal jar and let it sit at room temperature for no more than 2 weeks. Strain vinegar, removing petals and herbs and place into a clean mason jar. Store in refrigerator and use for salad dressing. I absolutely love pesto! I fell in love with it years ago as an easy condiment to keep in the fridge to use and nibble on throughout the week. 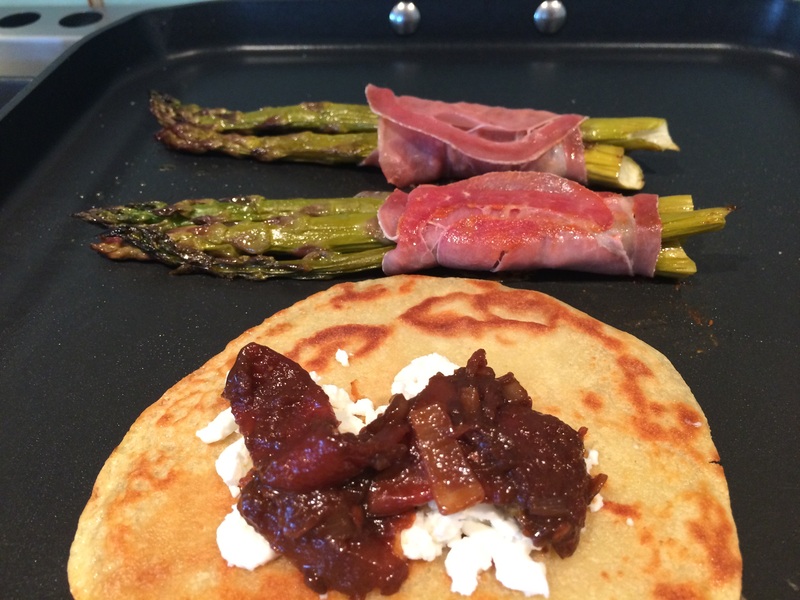 It’s tasty, easy to make and it’s adaptable! The most basic version of pesto is basil, pine nuts, garlic, Parmesan cheese, EVOO and a pinch of salt (I add a bit of balsamic vinegar, as well)! I quickly found myself adapting the basic recipe, mostly because I was missing one ingredient or another. 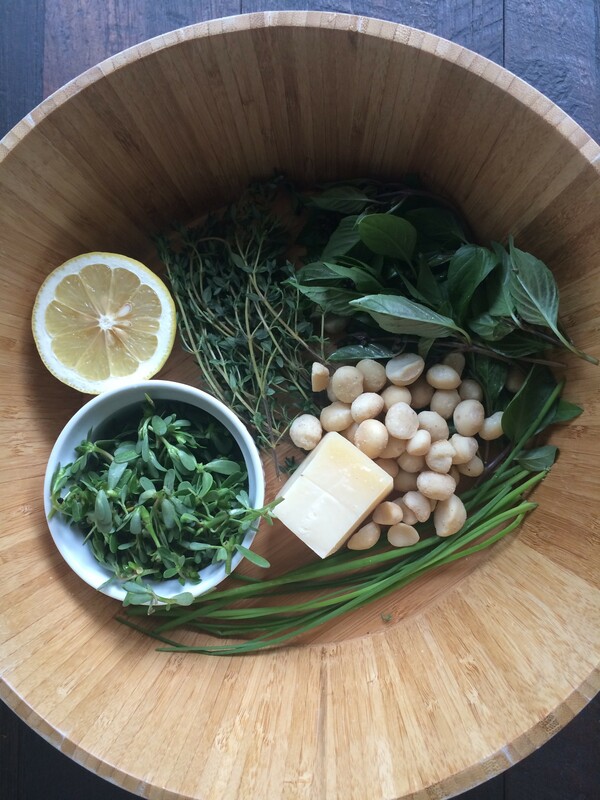 The best part about creating your own pesto, is that THERE IS NO RECIPE NEEDED! Just a simple combination of your favorite ingredients, a blender or food processor, and you are set! 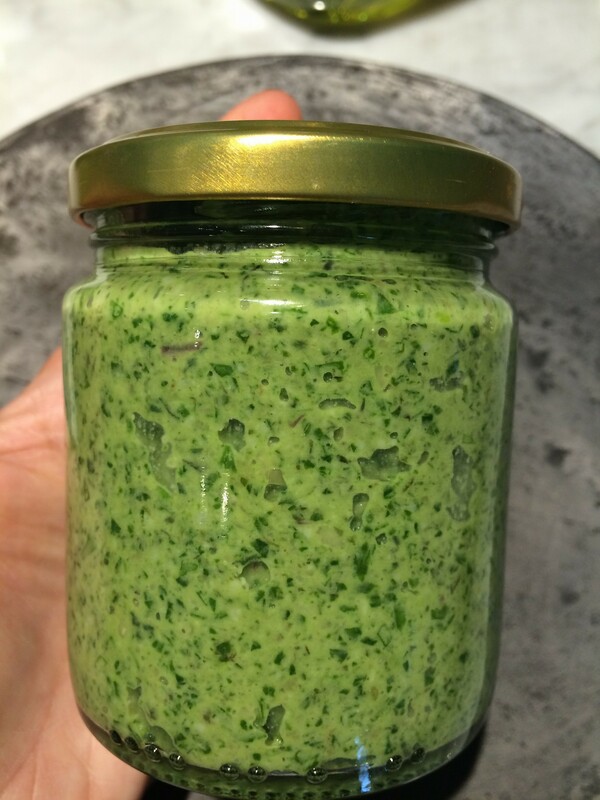 A jar of homemade pesto! -Any kind of greens or herbs or combinations of the two (basil, cilantro, mint, tarragon, thyme, kale, spinach, etc). -Any kind of nuts (pine nuts, almonds, pepitas, macadamia nuts, cashews, hemp seeds, etc). 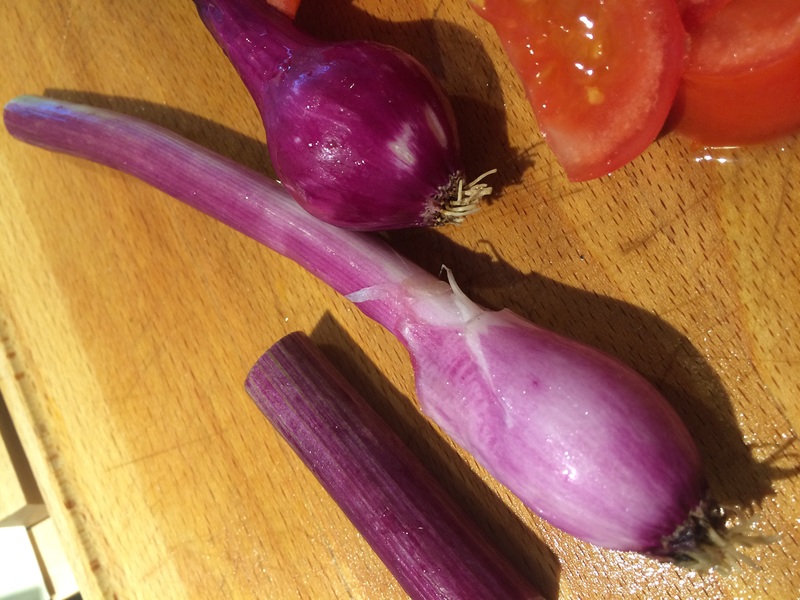 -An allium (garlic, shallot, onion, scallions). -Any kind of hard cheese (feta, cotija, Parmesan, manchego). -An acid to add flavor and retain color (vinegar, lime or lemon juice). -Extra flavor additions (olives, capers, peppers, chilies, etc). Wide variety of pesto greens, including Serrano chilies. Just a quick pulse in the food processor or blender! Once you get familiar with the flavor combinations you like, you can perfect the ratios of each ingredient. 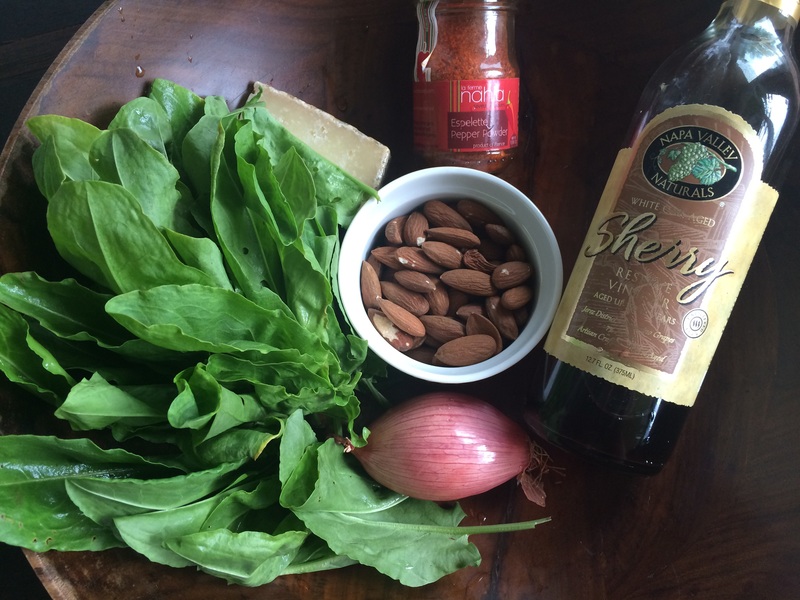 I love my pesto, super nutty and chunky, so I hardly use any oil and I just pulse the ingredients together, lightly. Sometimes I have tons of extra greens on hand, so I’ll make the pesto more green, with hardly any nuts. Macadamia nuts and cashews, are very rich and creamy on their own and do not require any cheese. These are great to use if you want to make a DAIRY FREE pesto. You really can’t mess this up! If you need extra flavor, add more acid, salt or cheese. Just play around with it! More of a marinade paste, than a pesto. A few quick pulses in the food processor and you are finished! Makes a tasty and gorgeous marinade! This pesto was made from the abundant supply of fresh and unfamiliar herbs I received from our CSA box this week:) (Be sure to remove the thick stems on the thyme, as best as you can, using just the leafy greens!) This pesto came out super lemony and fresh tasting. It would be perfect simply tossed into some fresh pasta, but being gluten free, I have my own plans! It will be used as a marinade for seafood later this week, added to tuna salad and used as a base for a tasty vinaigrette. This pesto is Spanish inspired, with extra vinegar and tons of flavor. It is much richer in flavor. 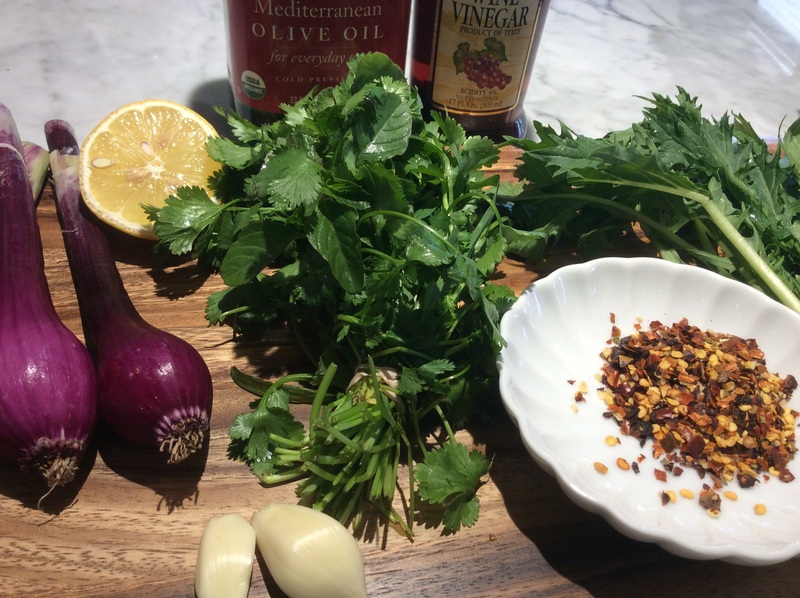 I’ll use it as a marinade for beef or pork, add it to a quinoa salad for extra flavor and use it as a base for a tomato salad dressing. As you can see, the combinations are endless! Have i inspired you to give it try? Make sure and let me know what you create! I’m going to experiment with using root vegetables next! Stay tuned…. 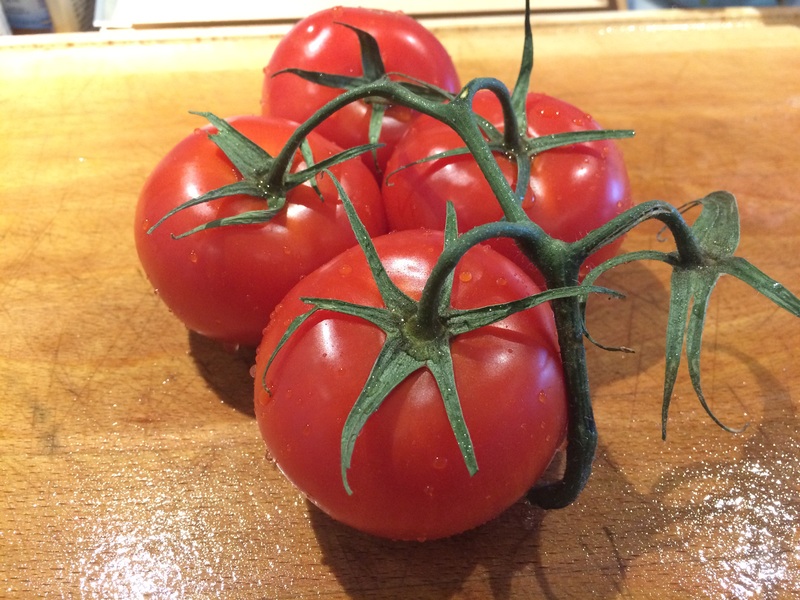 One of my favorite summertime indulgences is a vine ripened tomato. Unfortunately, we don’t get the best that our local farmers offer, until later in the season. I keep buying tomatoes and getting disappointed. They just aren’t so good, quite yet. So I needed to come up with a way to use all of these tomatoes! I’ve always loved the bold and zesty flavors of sundried tomatoes. They are a household staple, always providing an instant burst of flavor, to an otherwise, dull meal! So I came up with a way to capture this zesty flavor, in a spreadable, adaptable ‘jam’. 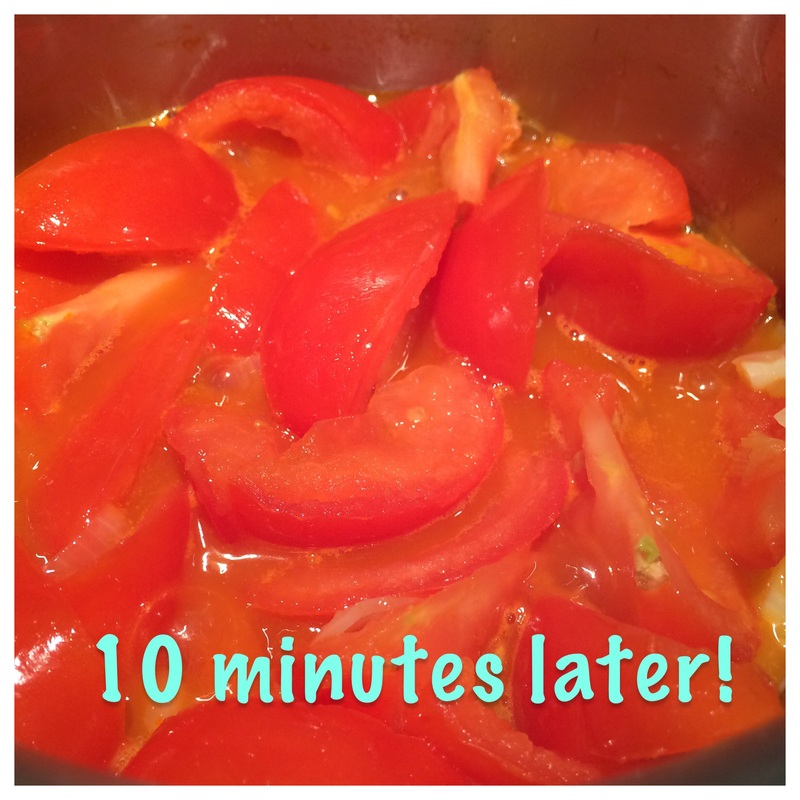 Toss the tomatoes in the pan! I sliced my tomatoes into quarters, added a little olive oil to my sauce pan, heated the pan to medium heat and tossed the tomatoes with a hefty pinch of salt. 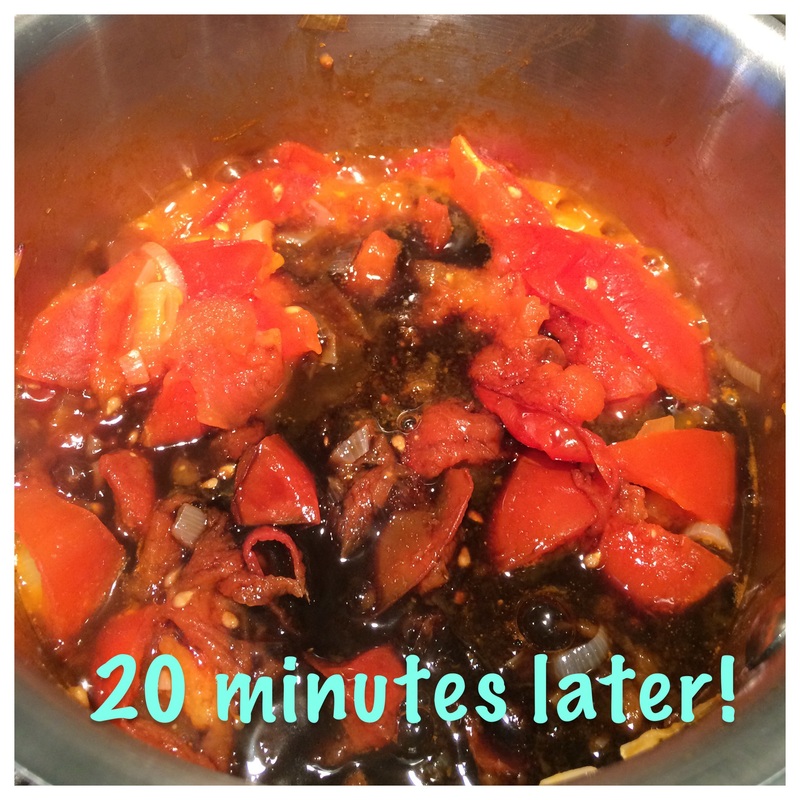 I stirred, every few minutes, as the heat broke down the tomatoes. This is what they looked like after 10 minutes…. At this point, I added 2 small spring onions, sliced thinly. You could add any onion or even a clove of garlic. I decided that I really wanted to rely on flavor of the tomato, so I kept it simple! So, I continued to let the tomatoes simmer for another 10 minutes. As the liquid cooks off, you can smell the concentrated scent of the tomatoes. You have to be patient and really get these cooked down, or else you’ll just end up with tomato sauce! 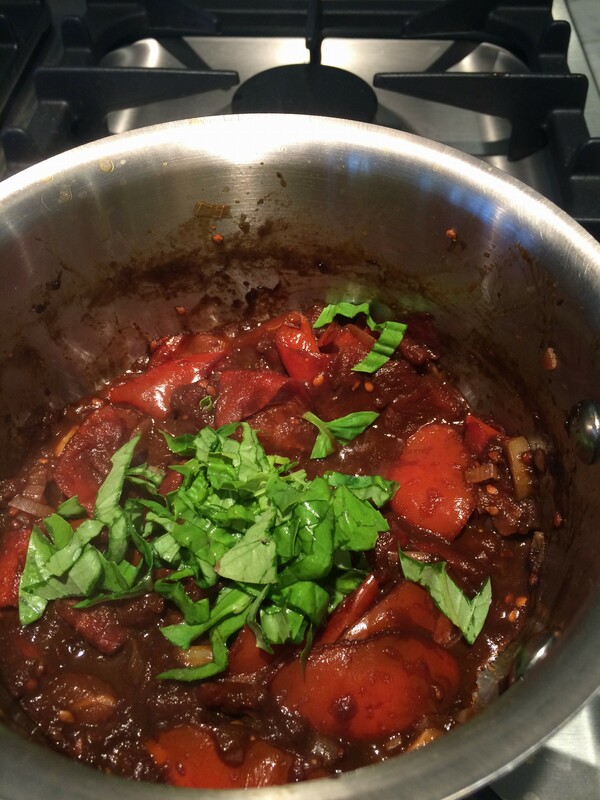 10 minutes later, I added some balsamic vinegar for added flavor and depth of color. And some fresh basil, thinly chopped. The fresh basil compliments the tomato flavor perfectly. Salt to taste. Keep stirring! You’re almost there! In these last 10 minutes, the color really intensifies, the onion is breaking down and the liquid is almost completely gone. Give it a taste! Add more salt, if needed. Reduce heat, to avoid burning. 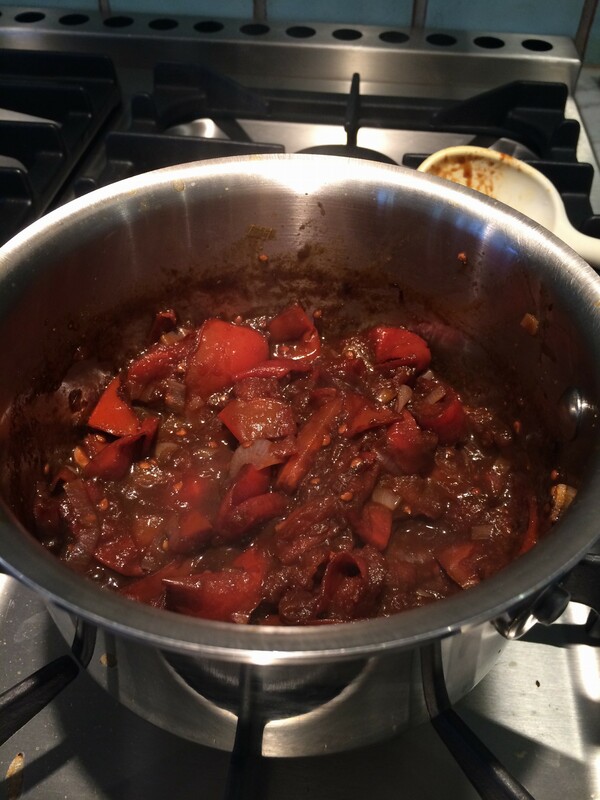 Cook down so it looks like this…. At this point your jam should be tangy, flavorful and thick. 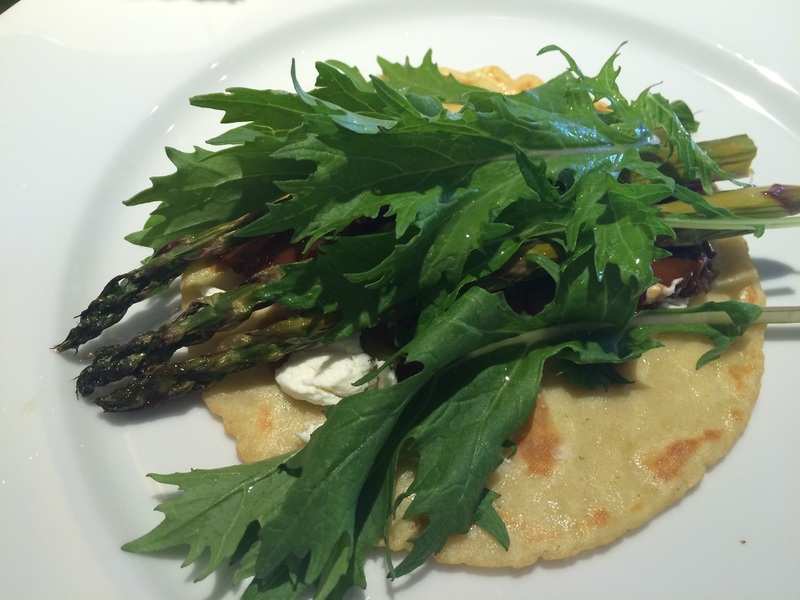 I immediately used it as a condiment for a savory crepe, adding crumbled goat cheese, roasted asparagus and topped with some local greens! Pure heaven! Feta would also pair nicely with tanginess of the tomato. 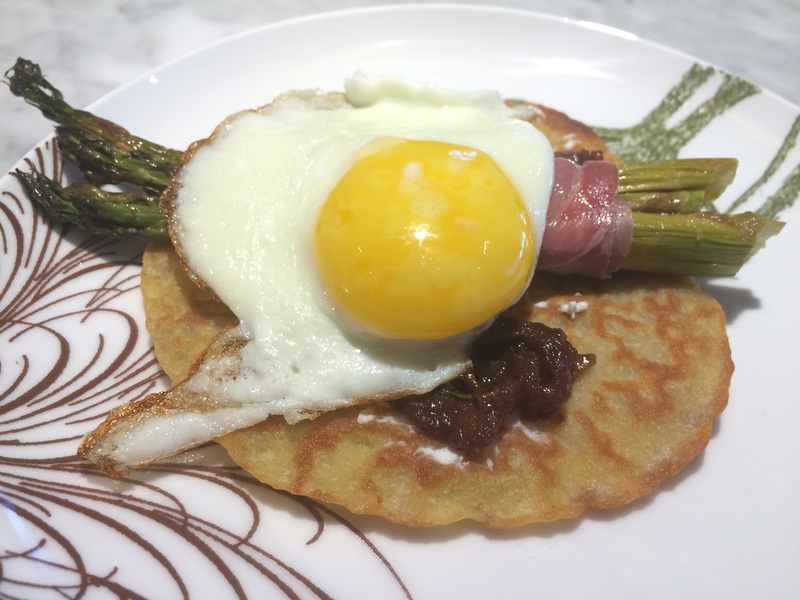 You can’t see it, but the crepe has tomato jam on it! As the week progressed, I experimented with using the jam in other ways. I used it as the base for a yummy salad dressing. Super simple and delicious! But, the best use is as a condiment for a wrap or sandwich. Quarter tomatoes. Add EVOO to small sauce pan and heat to medium. Add tomatoes and a hefty pinch of salt. Get tomatoes to simmer for 10 minutes, stirring occasionally. Add spring onion. Continue to simmer for another 10 minutes. Add balsamic vinegar and basil. Salt to taste. Continue to reduce, for 10-20 more minutes, lowering the heat if needed. remove from heat, once the flavor is to your liking and the jam is nice and thick. Salt as needed. Can add a clove of garlic or other herbs for a change in flavor! Use it as a sandwich spread, a garnish for a cheese plate, a base for salad dressing, etc! Keeps in the refrigerator for a week. Enjoy! So much gorgeous summer produce, so little time! 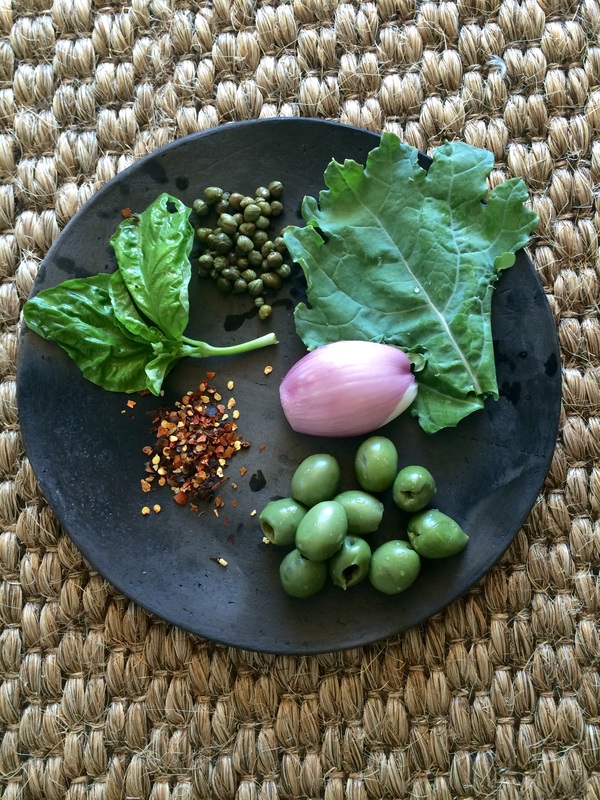 Here is a recipe for something a bit different than the average summer pesto! It’s fast and easy to make and you can enjoy it all week long, In a variety of dishes:)) It’s a beautiful green sauce called chimichurri! Have you tried it?! It’s very tangy! It’s a bit garlicky! It’s not too spicy! It’s adaptable! Originating from Argentina, chimichurri is used as a condiment with grilled steak, chicken and seafood. Traditionally, it is made of finely-chopped parsley, minced garlic, olive oil, oregano, and white vinegar. In Latin American countries outside of Argentina, Paraguay and Uruguay, the dominant flavoring is parsley, garlic, red pepper flakes and fresh oregano. Odds and ends from the farmers market! I didn’t have some of the traditional ingredients, so I improvised;). In addition to the vinegar, I added a squeeze of lemon juice. Instead of parsley, I used a new green that I discovered at the farmers market called mizuna. It’s in the same family as dandelion greens and has a light, peppery flavor. Really, most greens would work here. So experiment with you favorite:) In addition to the garlic, I added a couple small spring onions. I also added some cilantro and arugula. 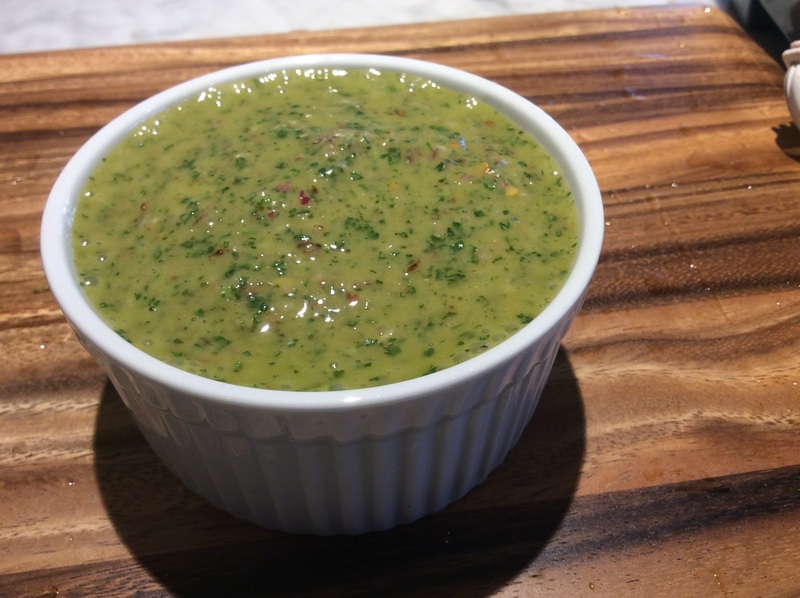 Other than those changes, it’s pretty close to a traditional chimichurri….but better! 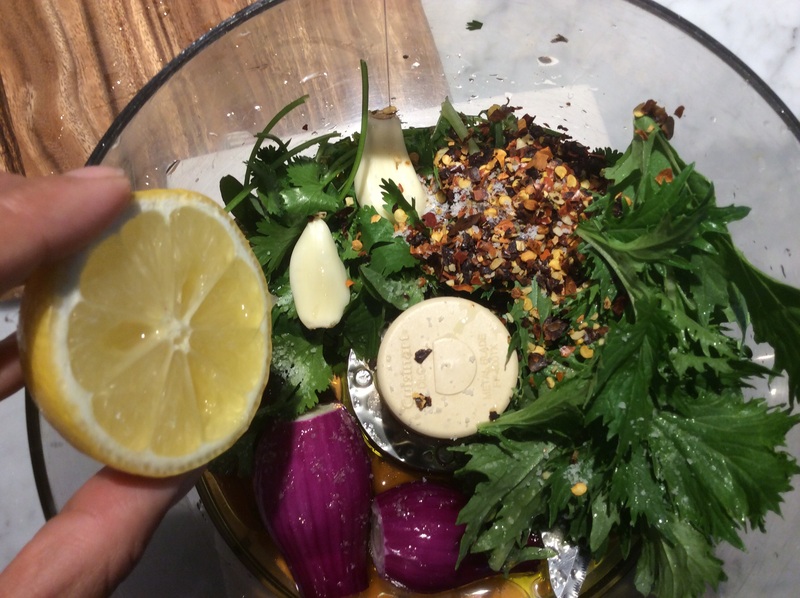 Place all ingredients into food processor and blend with EVOO and salt to taste. That’s it! You are done. Store in a mason jar, the fridge for up to 5 days! Besides grilled meats, the chimichurri can be used on top of eggs and makes an incredible base for salad dressings. Enjoy! A tasty, tangy, garlicky sauce to amp up the flavors of your next BBQ! Blend all ingredients in food processor! Store in refrigerator for up to 5 days.